Recently Modular Robotics, the maker of Cubelets, updated their Cubelets operating system (OS4). If you are planning on buying any new Cubelets, you’ll want to update your old Cubelets so they can talk to each other. 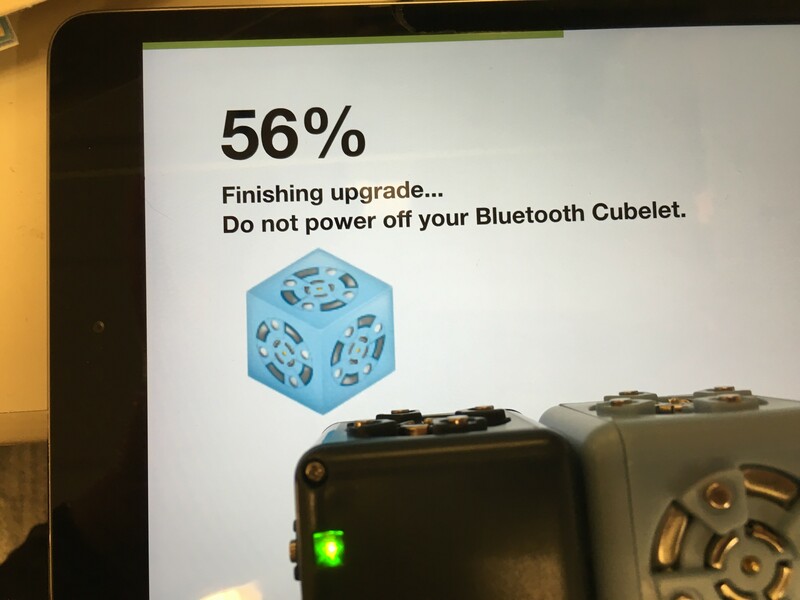 You need a bluetooth cube to do this. Last week, I needed to buy more batteries. It’s been my experience you can’t have enough batteries or Cubelet Drive cubes (the ones with wheels). So I ordered more. They asked if I wanted to updated cubes. Did I want my Cubelets to respond faster? You bet. There is a great video that explains how easy it is to update these cubes. Last Friday, I did just that. 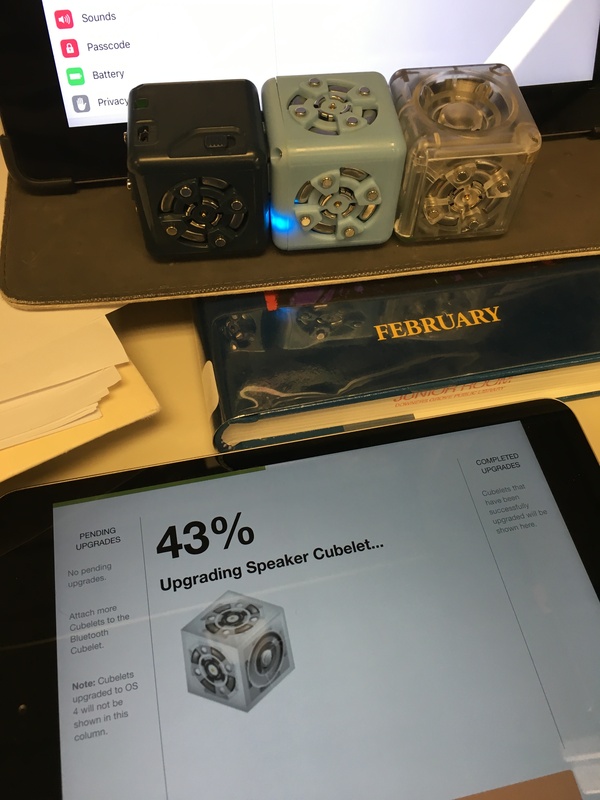 I downloaded the Cubelet app and followed the tutorial; first updating my bluetooth cube. There was a hiccup or two. I was slightly impatient with the process — I started it late on a Friday afternoon, and I was on desk. Not the smartest move on my part. But I handed it off to a co-worker who cruised through the process. Here are a few screen shots of what it looked like for me. The countdown to my speaker cubelet being updated. The last step of the update with clear easy instructions. Easy, clear instructions made this update go smoothly. We have a considerable collection of Cubelets, and they were done in under four hours. Also, we have both kinds of battery Cubelets (the ones with rechargeable batteries and the USB batteries). Both battery Cubelets updated without any problems.